Sometimes it’s the unlikeliest motorcycles that become popular with custom builders. 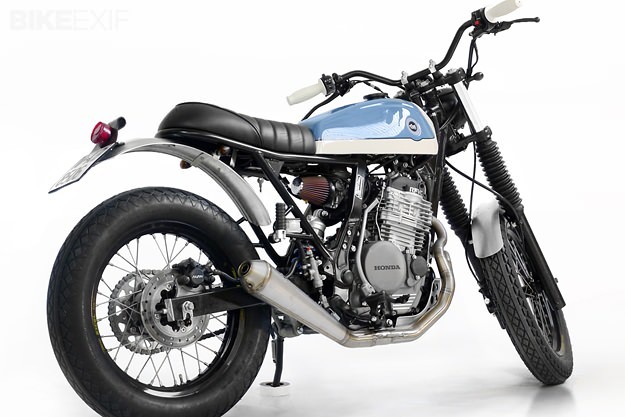 The Yamaha Virago is one, and the Honda Dominator another. 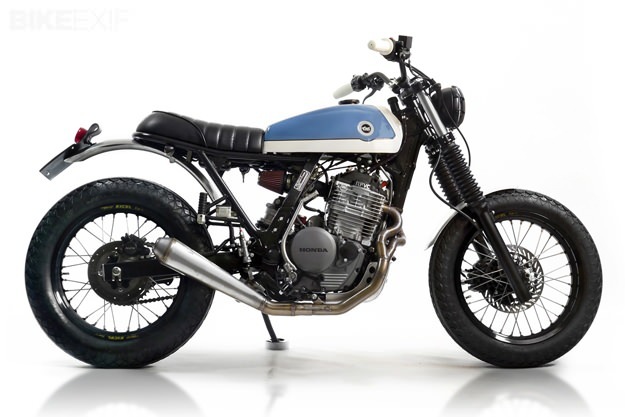 This is CRD’s take on Honda’s venerable NX650 dual-sport thumper: they’ve stripped off the clunky plastics and added a strong dash of Spanish style. Built over two months and now sold, the looks of this Honda Dominator have been transformed by the addition of a new tank. Taken from a 1976 Bultaco Mercurio 175 GT, it’s been painted in an elegant blue-and-white two-tone. CRD swapped out the wheels for classy 18” Excel rims, now shod with Coker Diamond rubber. 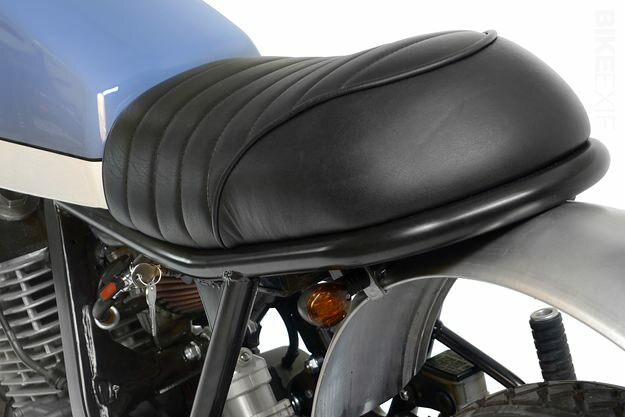 There’s a custom fabricated seat—with a relocated battery underneath—and new fenders. The suspension also gets a big upgrade, with rebuilt and shortened forks and an Öhlins shock at the back. The stock 644cc motor has reasonable torque, but the 40mm Keihin carb now breathes through a K&N filter. 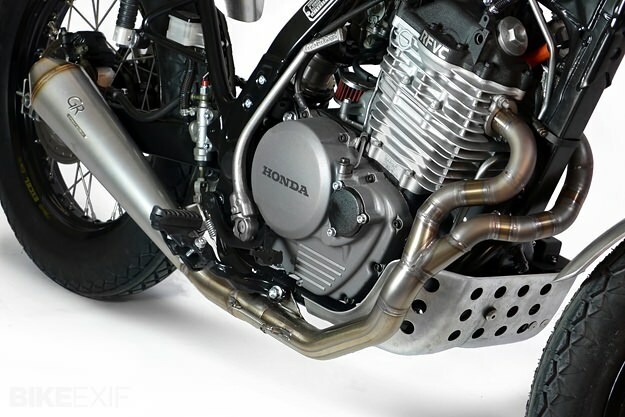 The high-set exhaust has been replaced by a sinuous, intricately welded custom item from GR. 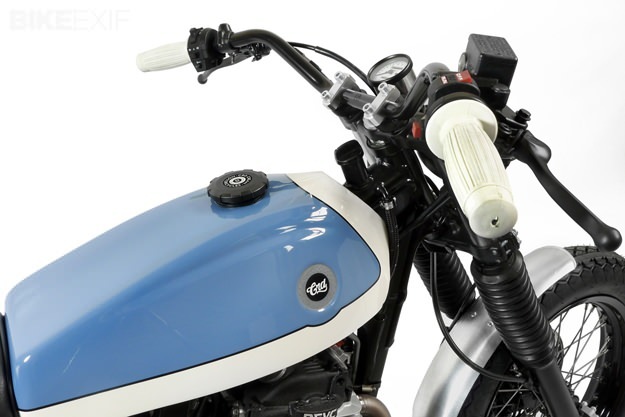 The lights are now CRD’s own designs, and the bars are from the German Triumph specialists LSL. Looks good, doesn’t it? My bet is that secondhand Honda Dominators will soon be in short supply. 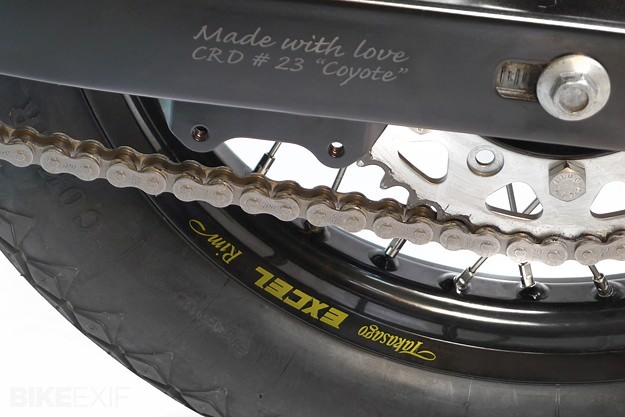 Check out previous CRD builds in the Bike EXIF Archives, and keep up with CRD’s news on their Facebook page.